Digi-Schlock: CANNIBAL FEROX (Grindhouse Releasing 2 Blu-Ray/1 CD Set) – Schlockmania! When Grindhouse Releasing revisited Cannibal Holocaust on an impressive blu-ray set last year, fans immediately began to speculate they’d soon give the same treatment to the other Italian flesh-ripper in their catalog, Cannibal Ferox. Within less than a year, Grindhouse Releasing has delivered on that wish for fans with a high-def update of this title – and the results are easily the best version of this title to date in terms of both presentation and extras. For starters, Cannibal Ferox has received a new 2K transfer for this release from the original negative. The resulting image is a significant upgrade: the gritty, grainy texture is faithfully reproduced but the colors and overall level of detail have a new depth and richness. In terms of audio, fans can listen to the Italian mono track (with English subs), the original English mono track or the 2.0 stereo remix that Grindhouse created for this title, all presented in lossless form. The 2.0 stereo remix was used for this review and it adds some nice depth to the music, which is a key part of the film’s style. Grindhouse Releasing has also put together a heroic package of extras for this set, so many in fact that it spills across two blu-ray discs. First up is a commentary track carried over from Grindhouse’s original DVD release of Cannibal Ferox, a composite track that combines separate sessions recorded with director Umberto Lenzi and star Giovanni Lombardo Radice. This track has a reputation as one of the classic exploitation flick commentaries and it fully lives up to that reputation: Lenzi gives the film a fond treatment, acting as if it’s a regular cult movie, which Radice takes a scorched-earth approach that dishes a lot of dirt about everyone, particularly Lenzi. The dueling viewpoints make this track into a battle of Lenzi’s intense ego and Radice’s scathing wit, with the differences in their memories of key moments ma king for gripping listening (particularly when the subject of animal cruelty arises). The first blu-ray also features a feature length documentary on the Italian cannibal film. Entitled Eaten Alive, this Calum Waddell doc covers this fascinating subgenre from Man From Deep River through its mid-’80s demise, charting its rise and fall through the comments of filmmakers, actors and genre critics. On the filmmaker side, highlights of Eaten Alive include Lenzi and Ruggero Deodato sniping at each other in separate interviews over who pioneered the Italian cannibal film, Me Me Lai telling tales of the hardships of starring in these films with elegant wit and director Sergio Martino discussing the tricky subject of animal cruelty in his film Slave Of The Cannibal God. The critics also have plenty of controversial things to say as they parse the perceived misogyny and racism that these film are sometimes attacked for as well as whether or not they actually critique Western culture. They serve up some interesting thoughts on why the genre died out and make cases for personal favorites, including an interesting defense of the oft-dismissed Emanuelle And The Last Cannibals as a pioneering film in the subgenre. All in all, it’s a fast-paced piece full of both historical details and critical viewpoints that will get fans talking. Bonus features on disc one are rounded out by three more extras. The first is a reel of a trailers for their film: an international spot, a German spot, the U.S. trailer (under the alternate title Make Them Die Slowly) and a Mexican trailer. All four are exploitation hard-sells in the classic style with interesting differences in the footage used for each. 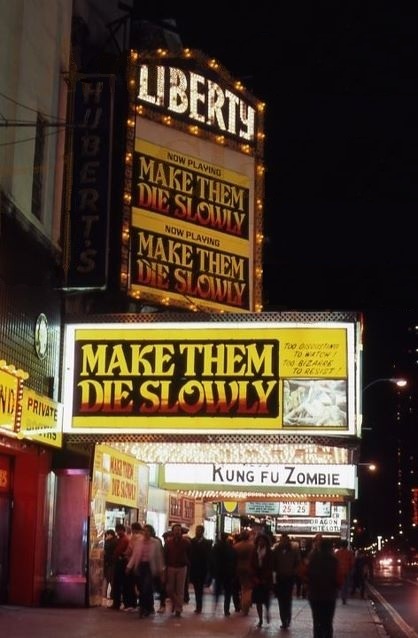 The champ of the bunch is the Make Them Die Slowly spot, an eye-popping highlights reel of gore toppe d off with sleazy narration delivered in a deadpan style. 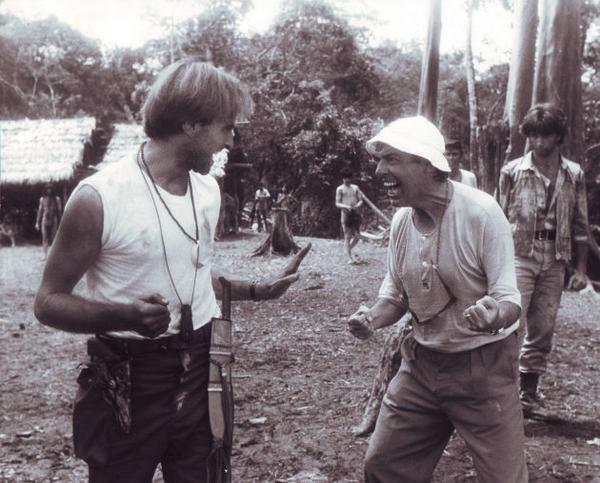 The second extra is a pair of extended scenes, one of a piranha attack and the other an extended take of the all too real pig-killing scene. Both scenes can also be integrated into the film itself if the viewer so desires. The final extra is just over five minutes of video footage from the Hollywood premiere that Grindhouse did for their remaster of the film in the late ’90s. Sage Stallone and Bob Murawski have fun playing carny-style hucksters, making a sleazy pitch for the film to bypassers, and there are also clips of the audience hooting and hollering in the screening as well as providing testimonials for the film’s trashy joys. That’s a pretty good set of extras on its own but the second blu-ray in this set adds even more. The heart of the disc is an expansive set of interviews. The first is a 20-minute chat with Lenzi, the same sitdown that his clips in the Eaten Alive documentary were drawn from. He’s known for his gift of gab and doesn’t disappoint here: highlights include a scornful riposte to Radice’s criticisms of the film, a wild defense of the film’s animal cruelty and his own theories about the origins of cannibalism. Along similar lines, an older 8-minute chat with Lenzi from 1998 includes his defense of the film as a critique of white imperialism and his pride over the film’s 42nd Street success. Radice returns for an impressive 51-minute featurette that allows him to share his thoughts on his classic ’80s run of Italian horror film roles, covering everything from House On The Edge Of The Park to Stage Fright. He remains pretty scathing on the topic of Cannibal Ferox but has interesting things to say about his other work, including how his role in House reflected a lot of his own problems as a young man and an interesting defense for Lucio Fulci’s controversial treatment of actors. He doesn’t spare himself, freely critiquing his own performances, and closes with an explanation of how he came to appreciate th e enduring fandom for his work. The next interview is the most surprising one on this set, a 25-minute session with Zora Kerova. She is unexpectedly charming and warm-hearted as she remembers her work on this shocker, starting with a funny tale of how she was cast and moving on to cheerfully told tales of the production hardships and working with the natives. She even tells a surprising tale of Lenzi’s kindness and expresses pride in the film’s enduring success, even in the face of harsh criticism she has received. Castmate Danilo Mattei is next up in a 21-minute piece devoted to his memories of the film. He is low-key and genial as he tells some interesting tales of the “wild west’ quality of the small town the production was based out of, a few interesting memories of the natives and his thoughts on the film’s controversial violent scenes and animal death footage. The last of the new interviews is a session with Gino De Rossi, who worked on the film’s gruesome effects. After some introductory moments where he conveys an almost religious respect for the art of special effects, he tells a variety of tales about the film. He expresses regret over the film’s animal cruelty, offers a detailed explanation of how he cr eated the rig for the film’s “hook-hanging” scene and even tells a touching tale of how one of the native kids became his assistant on the film and kept him fed throughout the location shoot. Next up is an extensive set of image galleries that include production stills, behind the scenes photos, promotional materials and video releases. There are plenty of treats for those who sift through this material. For example, the U.S. stills are a sleazy hoot, complete with lurid captions positioned over the objectionable imagery, and a poster for the film that retitles it Woman From Deep River. A clip of the Terry Levene interview from Grindhouse’s The Beyond special edition is included in this section that deals with Make Them Die Slowly promotional campaign. Also of interest in this area is “Ferox Fever,” a gallery that includes vintage zine writeups of the film, reproductions of screening flyers and even photos from the commentary sessions for Lenzi and Radice. Once you’ve exhausted the blu-ray content, there’s still more. The biggest of the non-blu-ray bonuses is the inclusion of the Cannibal Ferox soundtrack in CD form. Credited to “Budy-Maglione” (a.k.a. Roberto Donati and Fiamma Maglione), it’s a fascinating fusion of synth-pop electronics and disco grooves that makes an offbeat yet effective complement to Lenzi’s comic-book take on the Italian cannibal film. It’s an endlessly catchy and melodic listen – and Grindhouse Releasing presents the most complete version to date, offering up the full soundtrack plus six outtakes and over twenty alternate versions (even the tremulous rendition of “Red River Valley” is included). The final extra is a full-color insert booklet. Amidst gruesome stills, there are two essays on the film. The first is an account of the film’s debut night on 42nd Street from Bill Landis, the departed but not forgotten scribe behind Sleazoid Express. He covers the film from the grindhouse viewer’s perspective and offers some insider details on how the audience was uniquely attuned to the film’s style. The other essay is an appreciation from director Eli Roth, who reveals himself to be both well-educated and insightful on the topic. His breakdown of the difference in storytelling styles between Lenzi and Deodato is particularly edifying. In short, Grindhouse Releasing has done well by the other key film of Italian cannibal cinema with this release of Cannibal Ferox: the film looks great, the supplements are phenomenal and the expanded soundtrack is the kind of special bonus that shows Grindhouse’s dedication to their work. Any student of grindhouse or extreme horror needs to own it, preferably with the company’s equally stellar Cannibal Holocaust blu-ray set sitting nearby. 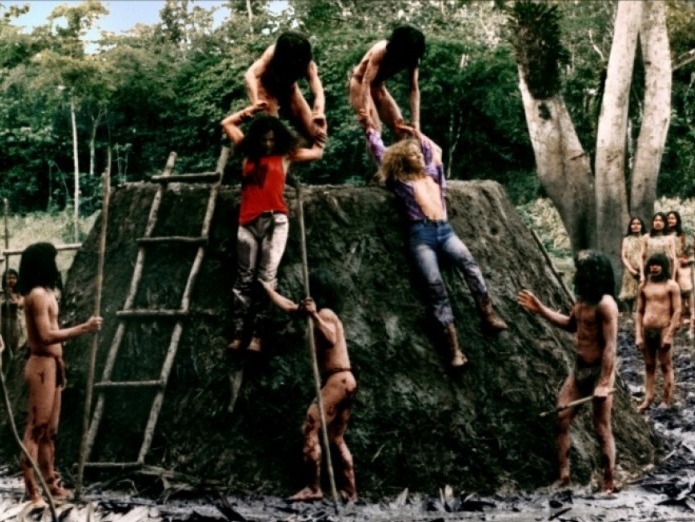 To read Schlockmania’s film review of Cannibal Ferox, click here.